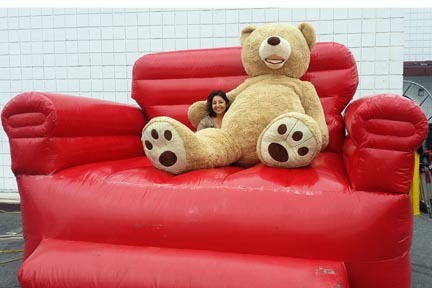 Hire Rent Big Teddy Bear Photos... feel like a kid again while getting your picture taken with our Giant Bear . Great for childrens' birthday parties, company picnics, holiday parties and other special events with photo stations. Giant Teddy Bear Photos - Who doesn't love big 'ol teddy bears? Feel like a kid, again, while getting your picture with our big stuffed bear. Great for holiday parties, Valentine's Day, children's events, and other special events with photo stations. Great to book together with our Big Red Inflatable Chair, too! Photo items and attendants additional.